This is a most popular question of Mathematics which most of our readers ask nowadays that how many 16.9 Oz Water Bottles makes a gallon. Most people get confused with the measurements of ounces, liters and gallons. That's why we have come up with this post which will guide you more about this topic in brief. Unit conversions is a challenging task where most people fail to get the correct values. Especially when we are talking about water there are several kinds of units to measure, like water is measured in ml (milliliter), L (liter), Oz (Ounces) etc. In my earlier post I have written about 7 Best Laptops for School Work under 500 Dollars. 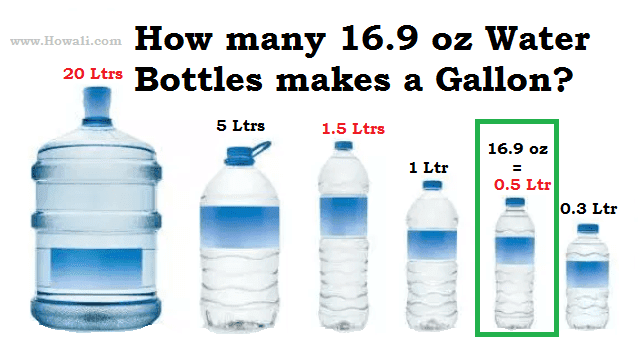 In this post I have explained how many 16.9 oz water bottles is required to fill one gallon. But before we move forward let me tell you that the contents of this blog are updated frequently, so don't forget to subscribe to my email list to receive more useful tips in your Email. Here we are looking for number of water of bottles. Each water bottle consists of 16.9 Ounces which could also be called as half liters of water. Here we have simply divided 128 by 16.9. You will get 7.57 water bottles as your answer. So 7.57 bottles of 16.9 oz is required fill one gallon with water. Answer: But here we are talking about bottles. As no one has a .57 water bottle, so we have to simply round it up to a whole number which makes it 8 water bottles. So the final answer here is 7 full water bottles and the 8th water bottle needs to be only 57% full. So I hope you would have understood how many 16.9 Oz water bottles makes a gallon. Do let me know through comments if you are finding anything still confusing. Don't forget to subscribe to my email list to get more useful tips of this blog in your Email. I would also request you to share this post with your friends from the social network buttons given below.